Pioneering producer Dom Sweeten and the 404Studio collective deliver Fusion Studio, a mighty heavy production pack to fuse the edges of Electronic Music into one writhing machine. This Industrial Strength audio sound set is primed with over a Gig of original content. Enter a world of dark Synth Loops, eerie Top Loops and deep Bass Loops. You'll find a slew of crisp Drum Loops and Drum Oneshots to lock in all your kicks, snares and hats; plus ear-perking Percussion Loops and auxiliary Shots to wield in your favorite DAW. Fusion Studio holds the tools for crafting tracks across Hard Dance, Tekno, and EDM. These pristine 24-bit, 44.1 kHz files are formatted in Apple Loops and Wav---and they're ready for the unstoppable in Battery4, Kontakt, and Logic ESX. Sweeten's prolific path includes a series of custom sample packs for ISR. 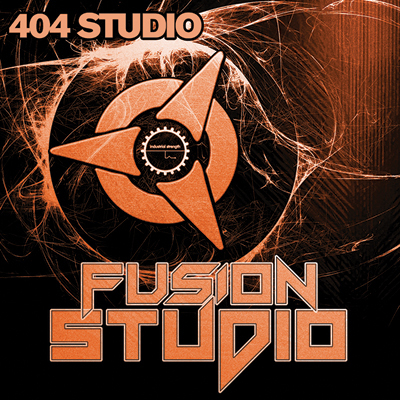 Add Fusion Studio to Fusion Loops and 404Studio Virus for even more genre-melting versatility. Fusion Studio : forfeit all boundaries.